This evening I was in the mood for something different. I grew up eating a variety of different cuisines. One of my father's favorites was a Turkish eggplant dish called Imam Bayildi (translated to mean the priest fainted) which can be served as either an appetizer or as an accompaniment to a meal. In the traditional version, eggplant is stuffed with onions, tomatoes, garlic and other seasonings and simmered over low heat for a long period of time. It's usually served either at room temperature or chilled. 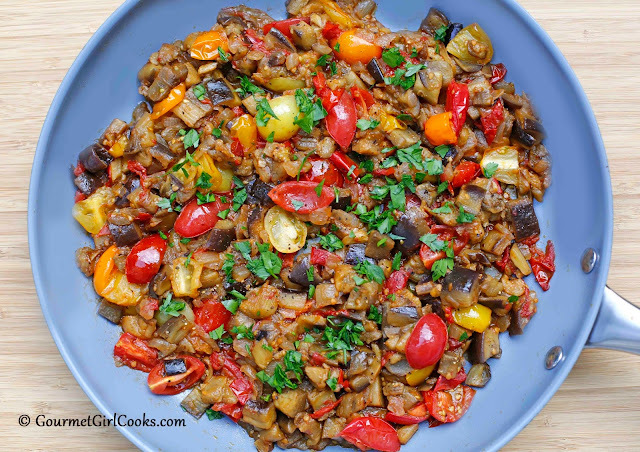 The eggplant and veggies are cooked until they are melt in your mouth tender and sweet in a liberal amount of olive oil. It is absolutely delicious. Unfortunately, it is a dish that can take upwards of a couple of hours or more to prepare...and who really has time for that these days; I know I don't. Don't get me wrong, if you have the time, it is totally worth it. I decided to put my own spin on it where I captured all the flavors but with a much more realistic preparation time. I made my own version of Skillet Style Imam Bayildi that only takes about 30 to 35 minutes total from "skillet to table." 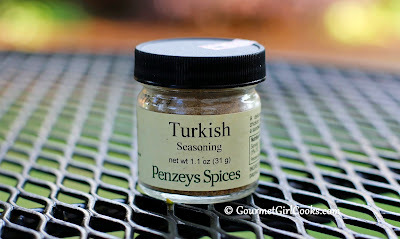 This evening, I used it as a side dish served on top of grilled boneless chicken breasts that I spritzed with olive oil and seasoned liberally with Turkish Seasoning (from Penzey's Spices). I let the Imam Bayildi cool to room temperature while the chicken was grilling. It turned out absolutely amazing to say the least. 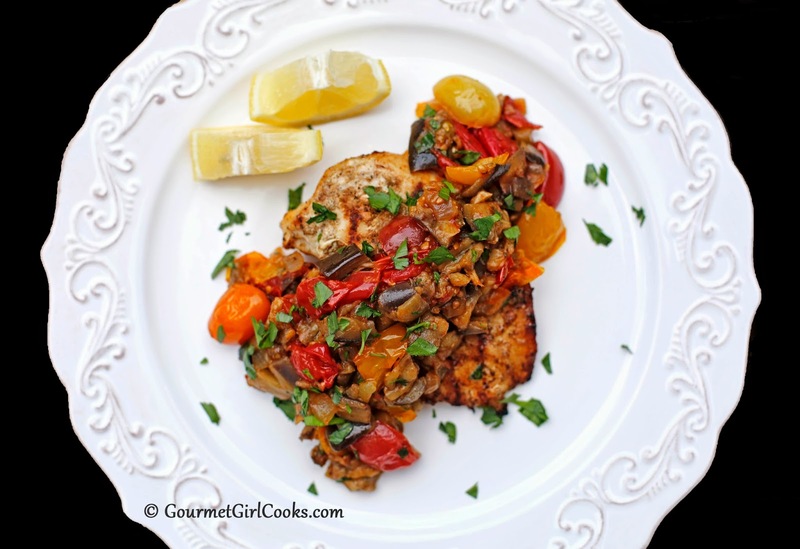 If you like ratatouille (which I do)...you will love this, too. It's simple, fresh and a perfect dish to use up your summer veggies. My simple recipe is below as well as a few photos of this delicious and gorgeous meal that captures the essence of summer from the grilled chicken to the bounty of summer veggies. The eggplants I used were so young and tender that they didn't have any seeds and were especially sweet. I also used the variety of fresh colorful tomatoes (red, orange, yellow, and purple) that I had on hand which made this dish particularly colorful. Enjoy! Heat 2 tablespoons of oil over medium heat in a large nonstick skillet with lid. Add onions and cook until almost tender, about 5 minutes. Add eggplant, garlic and 1 more tablespoon oil; cook, stirring frequently for a few minutes until lightly coated with oil. Add 1/2 cup diced tomatoes, 1/4 cup water and cover skillet. Cook covered until eggplant is tender, stirring occasionally, about 10 to 15 minutes. Add remaining 1 cup diced tomatoes and sweetener. Season liberally with salt and pepper, to taste. Stir in remaining 1 tablespoon oil, parsley and lemon juice. Cook uncovered about 5 minutes until thickened and excess liquid has cooked off (it should not be watery). Allow to cool to room temperature before serving. Refrigerate any leftovers. *Note: When I add eggplant to any dish, I usually remove every other strip of skin with a paring knife or vegetable peeler (it looks striped before I cut or dice it) to reduce the amount of skin by about half. You can choose to leave all of it if preferred. 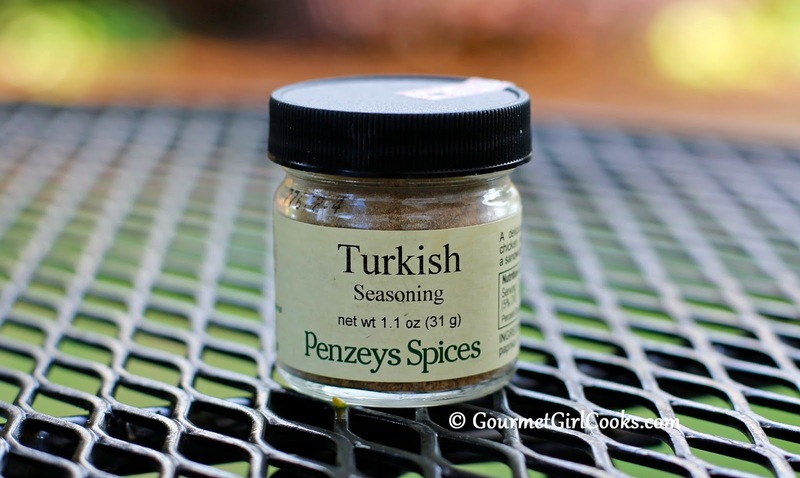 I'll have to look up that Turkish spice blend. I do think for those that aren't eggplant fans...if you can find small, young eggplant (like our Costco carries), it helps. Particularly if it has little to no seeds. I also think removing some of the skin helps too. I know that some people like to salt eggplant before cooking to draw out any trace of bitterness. I find that if you can find them small, they usually aren't loaded with seeds like some of the larger ones and that makes a difference. So beautiful! 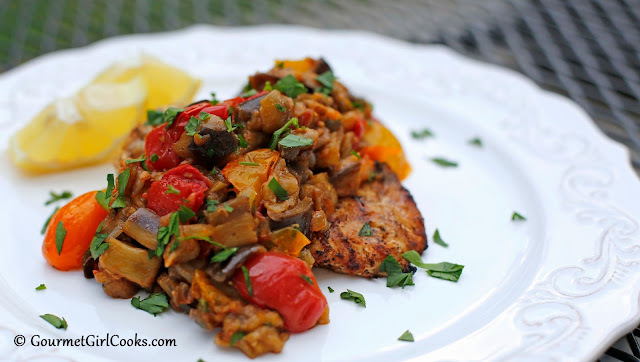 I'll have to add eggplant to my shopping list and try this. I know that it's traditional to serve this at room temperature, but does it hurt the flavor if I can't wait and eat it while it's hot? I cooked this tonight so I could serve it tomorrow. I added a bit of Zeus seasoning and some cumin. I couldn't help taking a couple of bites while it was still hot. Beautiful and delicious! Thanks for the recipe! Even better the next day! I crumbled some feta cheese on top and served it hot as a side dish. Wonderful with chicken.